We call rides with multiple stops and pickups “multi-stop rides”. Please keep in mind that all the riders must have at least one location in common. 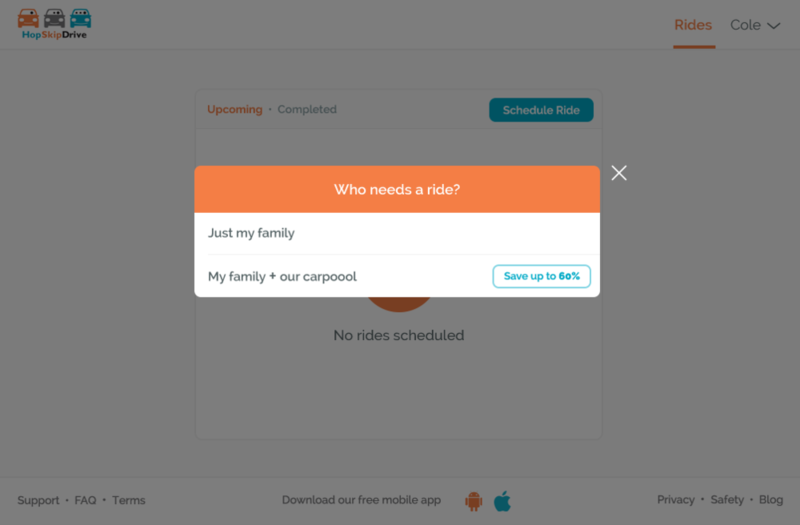 (They must either be picked up from the same place, dropped off at the same place, or both) To schedule a multi-stop ride using the website, sign into your account and click the blue “Schedule Ride” button. 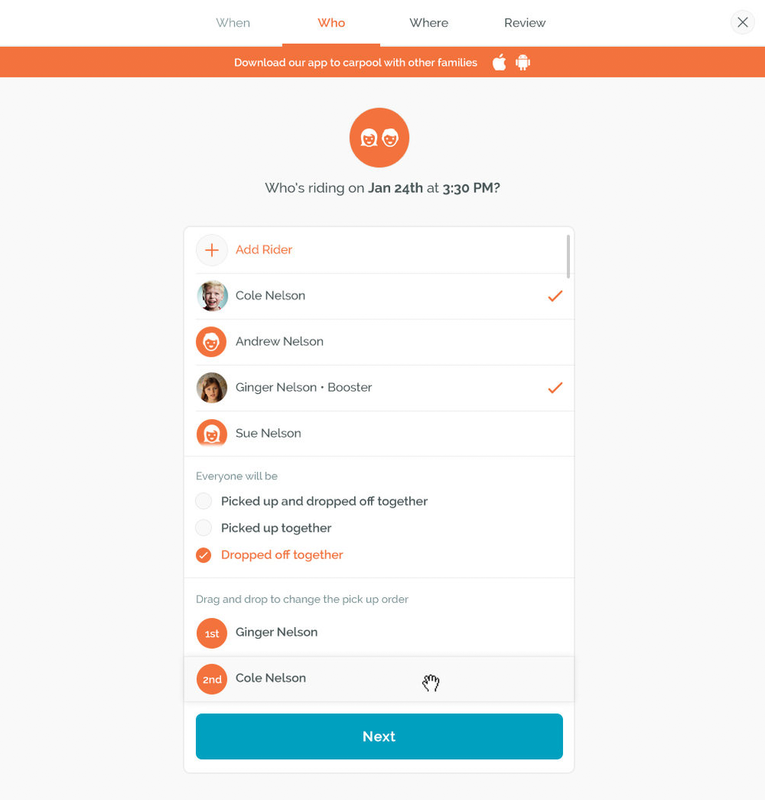 You can select to create a multi-stop ride for just your family or you can invite other to your ride and create a carpool. Let's create a ride for just our family. Select "Just my family". Next you'll see the calendar where you can pick the date of your ride. (Note: you must schedule your ride by 7:00pm the day before.) Be sure the correct date is highlighted in orange. After you've set the date, you can scroll the hour and minute to set the time of your ride. Be sure you've selected the correct time of day, AM or PM. Then click the "Next" button. Once the time is set, you'll be prompted to select your riders. You must have more than one rider in order to schedule a multi-stop ride. Be sure there are orange arrows to the right of each rider you selected. Next you’ll have to decide if you want all the riders picked up at the same place and dropped off at different places, picked up at different places and dropped off at the same place, or picked up at the same place and dropped off at the same place. Check the circle of the option you’d like. To change the pickup or drop off order, hover your mouse above the rider you’d like to move. Click on the rider and drag them to the position you’d like them to be in. Once the rider order looks right to you, click the blue “Next” button. Your next step will be to select the locations for each rider’s pickup and/or drop off. Pay close attention to the names of the riders in the top left corner for each option. You can add a previously used location or a new location for each rider. Be sure to add any notes you think might help the CareDriver to locate the rider. Each rider must have a location listed for their pickup and drop off. When you’re sure everything looks right, click the blue “Next” button. On the final page, you’ll be able to overview all the ride information. Click on “Estimate Fare” to see the estimated fare for your multi-stop ride. Verify that the credit card on file is the one you want to use. When you’re sure everything is correct, click the blue “Book Ride” button. Be sure you see this confirmation screen after booking your ride. If you don’t, your ride has not been successfully booked. If you schedule a multi stop ride where the riders are picked up at different locations and dropped off at the same location, you’ll be asked to set the time you'd like the riders to be dropped off for your ride. The pickup time you initially chose on a previous screen will be reset automatically to match your desired drop off time. You can check the automatically adjusted pickup time for the first rider on the final page, before you book your ride. If you don't like the pickup time you see, you can click the back button and adjust the drop off time to be later or earlier, thus making your automatically adjusted pickup time later or earlier.